The Benin Bronzes is the name given to a group of artifacts produced by the Benin Empire, which occupied the area which is today Nigeria. The Benin Bronzes consist of several thousand commemorative plaques and sculptures that were made of brass of variable composition (despite being called ‘bronzes’). Whilst such metalwork has already been produced by the craftsmen of the Benin Empire as early as the 13th century, many of the Benin Bronzes were created between the 15th and 16th centuries. The Benin Bronzes were seized by British forces during the Benin Expedition of 1897, and were given to the Foreign and Commonwealth Office. Many of the pieces were later sold, and ended up in the collections of museums around the world. Today, there are calls for the bronzes to be repatriated to their country of origin. 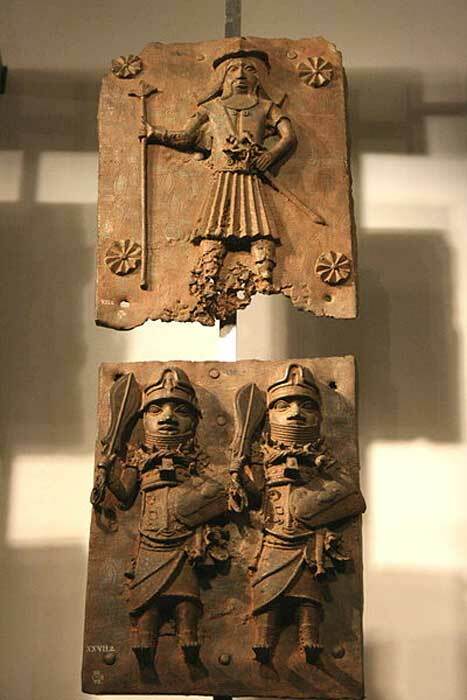 Brass plaques and sculptures have been created by the Edo (known also as the Bini), the indigenous people of the Benin Empire, as early as the 13th century, prior to their contact with Europeans. These pieces of metalwork were produced using a process known as lost-wax casting, a technique that was discovered as early as the Copper Age. It has often been remarked that the Benin Bronzes are some of the best examples of sculptures produced by this technique. The Benin Bronzes depict a variety of different themes. On the plaques, for instance, human figures, either alone, in pairs, or in small groups arranged hierarchically around a central figure, are represented. 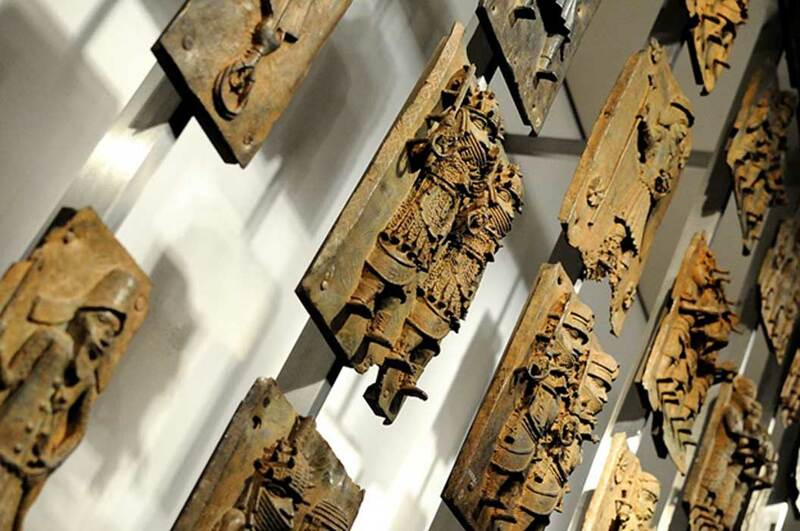 As for the sculptures, common themes include animals, human beings and scenes from life in the royal court of Benin. Interestingly, following their contact with the West, Europeans also began to be portrayed by the Edo craftsmen in their artworks. Portuguese soldiers / mercenaries, for instance, are often depicted, and may be recognised by the firearms they carry. A high level of skill was required for the production of the Benin Bronzes. For example, the craftsmen who made the Benin Bronzes paid great attention to the details of their creations. This is evident, for instance, in the minute details found on the attire worn by the human figures. Further proof of the craftsmen’s mastery of their art can be seen in the fact that the surfaces of the pieces were designed to show contrasts when the metal was irradiated by a source of light. Whilst the human figures represented are more naturalistic than most African art of that period, it may be noted that the facial features of most figures are exaggerated from their natural proportions. The metal required for the production of the Benin Bronzes was acquired in a form known as manilla. This was a form of money in the shape of bracelets that were usually made either of bronze or of copper. These were brought to the Benin Empire by European traders, and were usually exchanged for slaves. 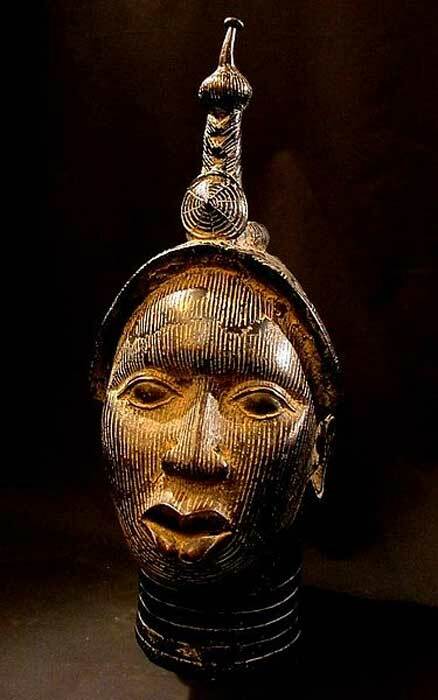 Therefore, it may be said that the history of the Benin Bronzes is closely connected to the slave trade, and that these beautiful pieces of art were made possible by the heinous trade in human lives. Nevertheless, this side of the story is often overshadowed by another episode in the history of the Benin Bronzes. In 1897, a punitive expedition known as the Benin Campaign of 1897 was launched by the British against Benin City. The Benin Empire was defeated, Benin City was burned and looted and the Benin Bronzes were seized by the victorious British troops as war booty. These pieces of art were sent to the Foreign and Commonwealth Office, many of which were then sold to cover the cost of the expedition. A large number of the Benin Bronzes ended up in the British Museum, whilst other pieces were purchased by museums around the world. Why Did Parents in the Chinookan tribe Perform Cranial Deformation on their Babies? Fair Spoils or Time for Repatriation? There have been many calls over the years for the Benin Bronzes to be repatriated to their country of origin. Occasionally, these have met with success. In 2014, for example, two pieces of the Benin Bronzes were returned to Nigeria by Mark Walker, the grandson of one of the soldiers who took part in the campaign of 1897. In 2016, a bronze cockerel was taken down from the hall of Jesus College, Cambridge University, and there are discussions underway with the possibility that the sculpture would be returned to Nigeria. For the time being, however, many museums, such as the British Museum, where many of the Benin Bronzes are today kept, are still resisting the calls to repatriate these artifacts. No offense, but the main claim that you make in this article is totally and completely wrong. Although the Portuguese that arrived to Benin the late 15th century were able to buy a significant number of slaves for a one or two decades, it is actually the case that they eventually had a hard time getting the Benin kingdom to sell them enough slaves, because Benin kept restricting the sale of slaves more and more to the point where, by the early 1500s - by about the second decade or so of the 16th century - they were selling so few slaves that the Portuguese king at the time felt compelled to write a letter to the king of Benin asking him to open his markets (that is, to stop restricting the sale of slaves) to the Portuguese traders. However, there was no change, and in fact, Benin started to restrict the sale of slaves even further, to the point that eventually they close off the sale of slaves altogether and the Portuguese became disinterested in Benin and moved their operations further west, where they found the emerging kingdom of Allada and some other smaller kingdoms that were willing to sell them slaves in significant quantities. Keep in mind that the entire time that the early trade (late 15th century to early 16th century) between Benin and the Portuguese occurred, the Portuguese were actually buying other commodities from Benin like ivory and especially pepper at the exact same time. So actually, even during this early period of trade between Benin and the Portuguese, a large part of the brass or copper manillas and other brass objects that the Portuguese sold to Benin was actually sold in exchange for pepper and ivory from Benin. Furthermore, as already mentioned, Benin eventually restricted the sale of slaves. After the early 16th century, the vast majority of Benin's trade was in non-slave products like ivory and cloth (yes Benin sold cloth as well), and much later (19th century), palm-oil. Also keep in mind that even before the arrival of the Europeans, there was a copper trade from the western Sudan region of west Africa (especially around the area of today's Mali) down towards southern Nigeria. It was from such copper traded down further south from another part of west Africa that Benin obtained the copper utilized for the brass and bronze that it used in making its earliest sculptural art, before the Portuguese provided another source of brass after their arrival in the late 15th century. These works explain quite clearly that the vast majority of Benin's trade with Europeans was not centered around the slave-trade at all, and they also explain what I described above earlier - how the kingdom of Benin deliberately reduced the slave trade between Benin and European traders to virtually nothing. In particular, note what is stated in chapter 2 of Peter Fryer's book, on pages 14 through 18. He provides multiple direct quotes from British sources from centuries past that make it quite clear that British people (including officials, merchants, etc.) of the 17th-18th centuries understood very clearly how vital the slave trade and slavery was to their country's economic development and its increasing prosperity. I mean no offense, but the main argument of your article is fundamentally untrue in every way. It was not Benin that needed the slave trade to finance its glory. Benin had already had access to copper (to use to make bronze/brass art) through trade routes from other parts of west Africa even before the arrival of Europeans on the west African coast, and it was Benin that killed off the slave trade with Europeans within a matter of a few decades by deliberately restricting the sale of slaves to such an extremely low volume that the slave trading Europeans (at this time, the Portuguese) lost interest and went elsewhere in search of slaves. In addition, during that period, Benin was trading in other products to a great deal as well - particularly pepper and ivory - and after those few decades of early trade with the Portuguese, all its trade with Europeans afterwards was heavily dominated by other products and never by the trade in slaves which was always either non-existent or on a very small scale. In reality, it was Britain that financed its rise to glory through the slave trade, and there is abundant evidence to show this, which can be found in the three books I cited above. I mean no offense, but there is simply a lot of misinformation on the internet, and it does no good for your article to add to it. Please consult actual academic/scholarly sources (not internet encyclopedias or amateurish websites with agenda-driven articles by non-scholars) and you will see that what I am saying is true. The sources that you cite in your "references" section, are deeply, utterly, wrong and false in their claims about either Benin's rise to economic prosperity or about its artwork being closely tied to the slave trade. It is not surprising that some of the sources that you cite for your "references" are British. Unfortunately, many of them are themselves committed to hiding from the public just how huge a portion of their own country's rise to economic and technological dominance was based on slave-trade and slavery funds and they instead try to shift this reality onto certain other cultures. It is essentially propaganda and distortion and a direct inversion of the truth. It was Britain that had a bloody history of numerous atrocities (including genocide in Tasmania, atrocities in colonial Kenya, atrocities in India, and even in Canada against the First Nations), whereas the claims against Benin in this regard are wild distortions of truth and history - the supposed sacrifices were almost all executions of criminals, as the first two publications that I referenced above discuss. And it was Britain that owed so much of its glory to the slave trade, not Benin. Please seek out and find the truth in scholarly works by committed researchers and academics, and do not just trust any pieces of propaganda on the internet. The Benin empire banned the slave trade in its territory. Get your facts right Mr.